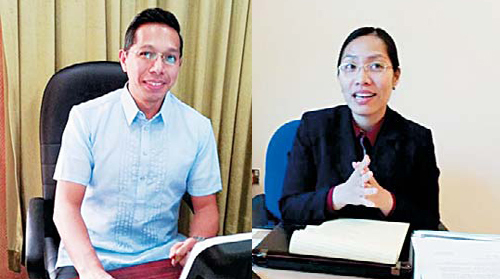 KUWAIT CITY, May 19: The Philippine Embassy line with its continued effort for to better serve all Filipino nationals has announced on weekend the arrival of two new officials to augment the embassy personnel. Philippine Ambassador to Kuwait Lamberto V Monsanto introduced First Secretary and Consul Jabbar Adiong and Third Secretary and Vice Consul Shiena Tesorero to the leaders of various Filipino organizations in Kuwait who were welcomed by the community. “I’m very glad that our personnel has been augmented with the addition of two new officers Consul Jabbar Adiong and Vice Consul Shiena Tesorero plus two additional consular staff, we will be able to provide better services, consular services and attend to the needs of our distressed nationals,” stated Monsanto. Adiong who finished his Bachelor’s Degree in Philosophy at the University of the Philippines in Diliman and went to the San Beda Law School, was previously posted in Qatar before taking up the assignment in Kuwait. “I’m very happy to be here in Kuwait, the people are warm and friendly. The place is unexpectedly quiet and peaceful. I’ll be handling political, economic, cultural, consular and whatever tasks that the Ambassador might assign to me,” disclosed Adiong to the Arab Times on Monday. He outlined that he would also promote cultural diplomacy and boost cultural exchange between the Philippines and the host country as well as other countries. For a start, as in charge of community events, he has been conducting meetings with various Filipino leaders in preparation of the celebration of the 116th Philippine Independence day in June. He urged everyone to attend the meetings and contribute ideas to ensure the success of the upcoming event. Meanwhile, Tesorero, also an alumna of the University of the Philippines in Diliman with a Bachelor’s degree in Speech Communication, finished her Bachelor of Laws at the University of the East. She was assigned as Third Secretary and Vice Consul in charge of Legal and Administration at the Philippine Embassy in Washington, DC from August 29, 2012 to April 28, 2014 before she volunteered to be cross-posted to Kuwait. She is assigned to handle the Assistance to Nationals Unit portfolio in Kuwait. “I’ve been praying for this post. It has been my desire to work at the OUMWA (Office of the Undersecretary for Migrant Workers Affairs). Primarily, because I feel that this is where I can make a difference in the lives of our nationals. The main reason why I entered the Department of Foreign Affairs really was to assist our nationals. I had a background in Trafficking in Persons when I worked for the Department of Social Welfare and Development. I also have a legal background so I thought that maybe this is where I’m supposed to be and to maximize what I have, my skills as a lawyer and my background in social welfare. So this is the perfect place for me,” she pointed out. Tesorero worked as Principal Assistant to the Secretary of Foreign Affairs from December 2009 to August 2012 before she was sent to Washington, DC for her first foreign assignment. She also had a stint as Foreign Service Officer in Training at the Foreign Service Institute, DFA from May-December 2009. Before joining the foreign service, she worked as Legal Officer IV at the Department of Social Welfare and Development (DSWD) Legal Service, Central Office from October 2007 to May 2009 and Consultant and Lead Quality Controller at the RR Donnelley Company from January-August 2007. With barely two weeks in Kuwait, Tesorero has been very busy in her office after a number of cases have already been referred to her. “They are really intense. It mostly involves our household service workers. I can see that they are really in a tight situation in terms of human rights perspective, workers rights perspectives. Mostly are cases of abuse, sexual abuse, we have trafficking in persons, labor trafficking also sexual slavery, prostitution. I have counseled so many since my first day here, providing legal assistance, providing solutions, been giving transitional accommodations to some of them,” she outlined. The two new officials called on Filipinos in Kuwait to work hand in hand with them and with the embassy in promoting the rights and welfare of all Overseas Filipino Workers (OFWs) in Kuwait.